Safeware’s strong company culture continues to grow with a new associate-driven Women’s Leadership Group focused on professional development and peer networking. 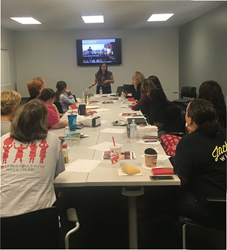 Safeware's Women's Leadership Group provides the opportunity to come together as a group of career-oriented women and discuss the paths that we each want to take within the organization. Safeware, a leading provider of product protection and extended warranty solutions based in Dublin, Ohio, has launched its latest cultural initiative. Since the inception of the Women’s Leadership Group in May of 2016, this initiative has become a new opportunity for Safeware associates to network, focus upon professional development, discuss topics relevant to workplace success and attend female leadership events. With more than sixty percent of the company’s female associates involved in the group’s activities, the program has resonated with members, and is a highly regarded addition to Safeware’s corporate culture. The group takes part in collaborative and unique activities that focus upon high-value themes. These include events such as: guest speakers, attendance at offsite seminars, networking events and quarterly discussions pertaining to literature selected by the organizers. This allows the group to engage with a variety of content and event formats to keep members excited about growth and peer networking. Initially formed to create an atmosphere in which aspiring leaders can explore and discuss the unique perspectives of women in the workplace, the new group aims to provide additional resources for its members as they progress in their careers. In addition to the Women’s Leadership Group, Safeware’s other associate-driven programs include a Professional Development Series, as well as committees focused upon health and wellness initiatives, philanthropy projects, social events, and team building opportunities. To learn more about Safeware, please visit the company online or call 1-800-800-1492.